If your network is troubled, you can use a conventional protocol analyzer or network sniffer to find the source of your problem. But in many cases it will be more convenient to get a quick overview of what is happening in the network. Therefore the MaaTec Network Analyzer offers its real-time statistics component. You can use it to find the system that causes the most network traffic and congests the LAN or the server that causes the least network traffic, maybe due to a CPU overload. Or you can analyze the percentage of network bandwidth that each system and/or protocol consumes in your LAN. To help you troubleshooting a network, the Network Analyzer offers a large number of different statistics, and you can configure many aspect of the statistics view. As this may look a bit complex at first sight, you will find a short configuration guide here, followed by some usage examples with tips for the best network statistics module to use. You can use the New button in the Packet Sources/Sinks window or the 'New Statistics' command in the File menu to start a new real-time statistics session. This opens the Settings dialog that is used by every component of the Network Analyzer. You can set here different filters or network cards that shall be used when collecting statistics data. But the most important settings page is the statistics page that allows you to select the statistics module and to configure the columns that will be visible in the statistics window. First select a module, e.g. 'Internet Traffic per System and Protocol' (or 'L3 Addr Higher Protocol Statistics' if the 'Easy Statistics Mode' was disabled in the Tools menu). This module will display the traffic caused by different systems in your network together with the protocol that was used. Now you can select the columns you want to see and configure their format. Use the Add button or double-click items in the 'Values' list to move them to the 'Columns' list. Every row in the 'Columns' list corresponds to one column in the statistics window as shown below. You can choose between text or a bar graph format for most values. If you want to use bar graphs you need to configure the maximum value for that column. Otherwise the application won't know which bar size to display for different values. If currently small fonts are used for the list display, which is the default, you should use the Small Bar format. The normal bars are larger and can be used with font sizes of 10 point and more. If you are satisfied with your settings, click OK and start the data collection. The MaaTec Network Analyzer will remember your settings for every statistics module. But you can also save your settings to disk or into the Quick Load list of the settings dialog. While statistics are collected you can change the sorting of the displayed data by clicking the column headers. The view is updated two times per second and displays the average values of the last two seconds. You can also open additional windows via the Window menu to see the same statistics with different sorting or you can open other statistics or protocol analyzer windows at the same time. Internally the Network Analyzer application uses highly cache optimized data structures and sorting algorithms, thus the CPU will not be overly stressed. The modules are assigned to six functional groups A to F. Group A contains only one module for network interface statistics. This will simply display the total traffic volume for every network card in your system. Group B contains two modules for address statistics. It can display the total, received, and sent traffic for every system (or better for every address) in your network. Usually an address corresponds to a single computer system. 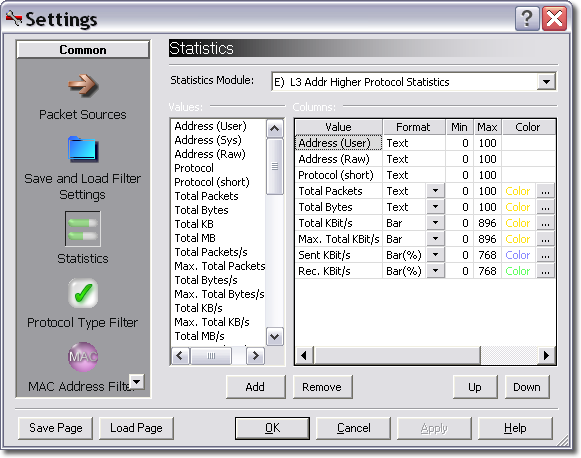 Many statistics modules can display statistics for LAN (L2 addresses) or internet traffic (L3 addresses). The 'L' stands for a network layer as defined in the OSI standards. Layer 2 addresses are the MAC addresses of your network hardware, while addresses that are defined by network protocols are usually layer 3 addresses (e.g. IP-, IPX-, or NSAP-addresses). The difference is that Layer 2 addresses are only valid and visible inside the local network (LAN), while layer 3 addresses are used to identify systems in the whole internet. Hence internet (L3 address) statistics will give you many more details about the systems that communicate together, while LAN (L2 address) statistics can be used to find the gateways in your LAN that are used to transmit packets to other LANs or the internet. Back to the statistics modules: Group C contains modules for directed traffic statistics. These display the traffic that is sent from one address to another address (A-->B) or between two addresses (A<->B). If you are using the A-->B modules, you will usually find two entries in the statistics window for data connections between two computers, one for each direction. Group D contains modules for protocol statistics that will show the traffic that is generated by different protocols in your LAN. Group E contains modules that combine address and protocol statistics. With these modules you can see the traffic that is caused by every computer in your network together with the protocol that is used (e.g. PC XY uses 80% of your internet bandwidth by loading data via the Kazaa protocol). Finally group F contains modules that combine the directed traffic and protocol statistics. They show the traffic on different connections in the network together with the used protocol. If you switched off the 'Easy Statistics Mode', the protocol statistics modules offer even more detail options than the address modules, so what does Lx or Higher Protocol mean. As above the 'L' stands for layer. Communication between computer systems involves different tasks (e.g. name resolution, routing, data fragmentation) that are defined by different standards and processed by using different network protocols. Often one protocol uses another protocol for for further data processing (e.g. HTTP data is sent inside TCP packets, these are wrapped into IP packets, and these are transported to a neighbor system inside an ethernet frame). Thus we get a protocol stack with different layers for different tasks. The Higher and Highest Protocol options will display the protocol that was used on top of the stack, which is usually the one you want to see. The difference between these two is that the Higher Protocol option will show the base protocol (e.g. SMB), while the Highest Protocol option will further subdivide some protocols (e.g. SMB into SMB - Transaction, SMB - Negotiate, etc.). So why do you need the other options? Some higher protocols can use different protocols on the lower layers. For example the SMB protocol can use either the NetBIOS over TCP/IP or IBM NetBIOS over LLC protocols to transport its data. So if you add or replace a server in your network, you may want to check the layer 3 traffic in the LAN to decide whether you need to configure the NetBIOS/LLC protocol on the new server or not. If you want to check the transfer speed of a broadband modem that is attached to a network card, use the 'Traffic per Network Card' ('Network Interface Statistics') and add Address, KBit/s, and Max. KBit/s columns. You may add a KB or MB column to see the amount of data that is transferred while the statistics collection is running. If your network or internet access is unexpectedly slow, use the 'Internet Traffic per System and Protocol' ('L3 Addr Higher Protocol Statistics') with columns for address, protocol, and transferred data. You will immediately see the computer and protocol that cause the most traffic. Maybe a broadcast storm due to some misbehaving application or a file sharing client that transfers MP3 files. If computer systems in your network are often reconfigured or added, you can check the network configuration from time to time. Maybe you removed your last servers that used the IPX protocol and want to check whether the IPX drivers were removed from all clients. In this case you need to use lower layer protocol statistics. These are not visible in 'Easy Statistics Mode', so ensure that it is switched off in the Tools menu. Now use the 'L3 Protocol Statistics' to see if there is any IPX traffic in your network (computers with active IPX drivers will occasionally broadcast IPX packets to find a server). If you find IPX traffic you can either use the 'L2 Addr L3 Protocol Statistics' to find the systems that send IPX packets or you use the 'L2 Address Statistics' and configure a protocol filter that hides the non-IPX traffic.